Quintessentially English, Oak is a wonderful choice of material for country homes and cottages, as well as period buildings where certain planning regulations may be in place. Where care needs to be taken to select windows suitable for planning regulations, oak is generally a very good choice. As well as seamlessly blending-in with the natural surroundings, oak can also be manufactured to incorporate the latest seals and a special casement to protect against the weather, giving it a contemporary touch. The natural grains and patterns make oak products so attractive that polishing or painting is not necessary, whilst Oak can also effectively resist damage from fungi, mold, water, stains and scratches, which is unlike items made from alternative types of woods. It is interesting to note that oak was the primary material used in the construction of naval ships until the end of 18th century. This is instructive of the superiority of oak products. We produce three different types of timber windows. Our flush oak windows look classic and are fitted with traditional handles while incorporating modern touches, such as high security locks and double glazing. Stormproof windows are a great choice for exposed areas, but they’re very popular simply because they are so durable. Finally, anyone who dislikes the appearance of modern double glazing can choose to have box sash windows fitted: these vertical sliding windows are an ideal replacement for single-glazed sash windows, providing superior insulation and security without spoiling the external and internal appearance of your home. Choose modern spiral balances or stick with a traditional pulley system for the classic sash window feel. If you really don’t want to lose the sash windows you currently have, or your building is protected by Listed status, our skilled craftspeople can actually replicate your existing windows almost exactly with thin glazing, or incorporate subtle yet secure locks in a range of different finishes. Oak windows do need to be maintained, and unlike uPVC windows, neglecting this maintenance can be damaging (please refer to our timber joinery aftercare guide). Our windows are guaranteed to be maintenance-free for four years (eight years if you choose a solid colour frame). After that, you can choose to employ someone to treat the frames or do this yourself if you prefer. Oak window frames should be coated and sealed to protect against the elements, and we would recommend you get into the habit of having this done every year after the guarantee period comes to an end. But oak isn’t just aesthetically pleasing: it’s also more environmentally friendly. If your windows are properly looked after, they will last indefinitely. 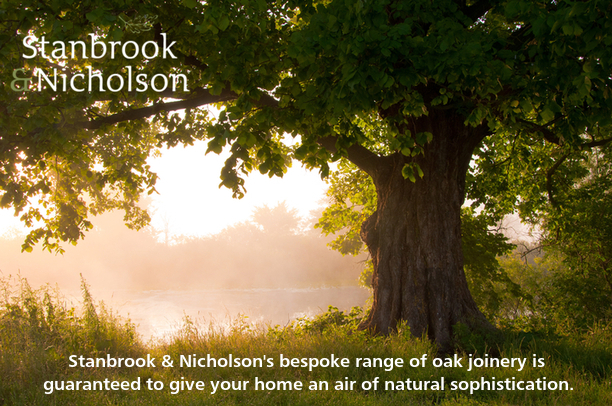 Furthermore, you can be safe in the knowledge that Stanbrook & Nicholson source our oak from renewable and responsible sources, felled from managed forests, with our manufacturing process complying with rigorous policies to ensure the least possible impact on the environment. Check out our Oak windows range here.